Doesn’t your cat just love going to the vet? No? Well he’s not alone among his fellow tail-wagging feline companions. Even though there are rare exceptions, the vast majority of cats get really stressed and nervous at the veterinary clinic. And it makes sense, right? I mean, we humans feel the same way about going to our doctor’s office. Try to imagine it from your cat’s perspective: strange people poking and prodding in all sorts of uncomfortable places, not to mention all the other crazy sick animals apparently doing their best to increase the general tension level. No fun for anyone involved. But what’s the alternative? All cats need to see a veterinarian every once in a while, whether it’s for routine vaccinations and blood tests or because they are sick or injured. 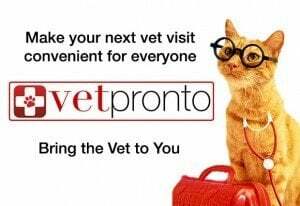 That alternative is VetPronto, a new model of mobile veterinary medicine that takes advantage of the most modern technology to provide you and your cat with an enjoyable, convenient, and financially transparent experience. We will send a veterinarian right to your doorstep for a housecall whenever it is most convenient for you. The vet will do a full exam and answer unlimited questions, giving you the peace of mind and confidence that is often missing in a more rushed clinic environment. In most cases, the veterinarian will be able to provide your cat with the treatment she needs right there, or write you a prescription that can be picked up at any local pharmacy or ordered online. Regardless of what is going on, our mobile veterinarians will come with the right equipment to help make an initial diagnosis and will spend as much time as you need discussing treatment options and coordinating your cat’s continued care. We’re not afraid to refer you on to an emergency hospital or specialist if that’s what your pet really needs, but we understand that a simple home evaluation is often all that’s really necessary. That’s what we do for our own pets, and now we can do it for yours, too. So what is all this going to cost? That’s the best part. VetPronto’s pricing is clear and upfront before you even make an appointment. You’ll know exactly what you’re going to spend, and you don’t have to worry about getting a hard sell for more tests and products. Our prices are comparable to traditional veterinary clinics, but with the convenience of in-home service, flexible scheduling, and more personalized care. That’s more like it, right? If it sounds like vintage James Herriot for the 21st century, that’s because it is. Competent and compassionate veterinary care in your own home or workplace, on your own time. Smooth, efficient, and personalized, giving you the opportunity to really talk to your vet again. In this age of overbooking and 15-minute appointments, where you’re lucky if your vet spends even five minutes with you before the support staff takes over again, it’s sadly a rare phenomenon. VetPronto: veterinary care the way your pet would have designed it. We humans have just taken a little longer to figure things out. Elliott Garber is a veterinarian and author recently relocated from Sicily to southern California. Check out his blog and podcast at The Uncommon Veterinarian, and find his short story about a wounded military working dog.